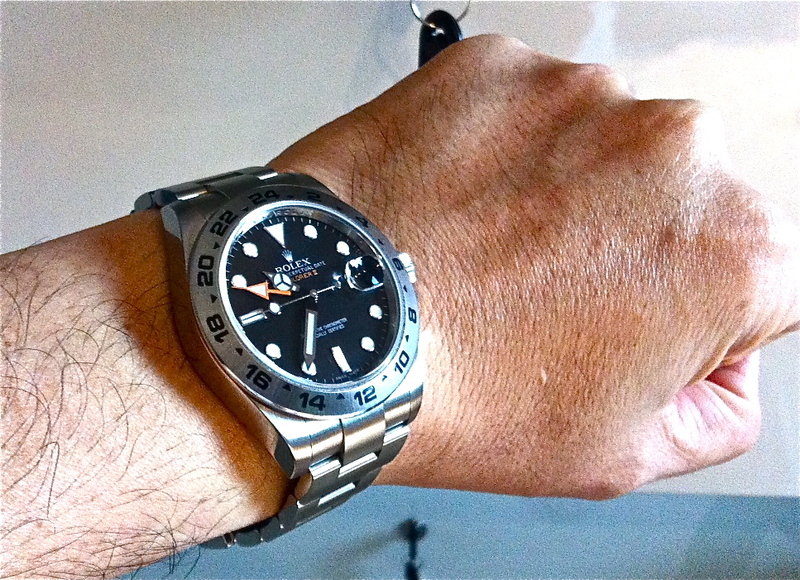 But as someone who spends a coupla minutes every morning pondering over which watch to wear, the Rolex Explorer 2 has always topped my list. Strangely enough, this was an unplanned purchase. I thought the 42mm case was a tad too small. The hype building up to its release did not help either, egging retailers to add a premium on the watch. I was actually holidaying with the family in Hong Kong last March when I chanced upon a retailer that had stock of this model. I was actually getting bored of not having anything to buy there. When I was quoted the price of SGD9,500, I could not resist. It was retailing at around SGD13,000 back home then. The latest incarnation of this iconic piece (one of many from the Coronet's stable) boasts several new features and advances over the previous model. Firstly, it's grown by 2mm, it's got a new heart, and most noticeably, an orange hand for the second time zone. The orange hand is a salute to the original Explorer 2 (ref. 1655) that was first released in 1971. In my opinion, the orange hand and text stands out better on the matt black dial than the white dial. I had first asked for the white dial at the shop but decided on the black because of this reason. The Mercedes hour hand adds a classic yet modern look to this classic. Another plus for the black dial is the "phantom effect" hands. It makes it seem like the hour, minute and orange hands are floating on the dial. The clean and simple dial gets my vote. More is really less in this case. Looking it straight in the face, it's hard to find any flaw with this design and construction. It's perfectly proportioned in almost every aspect. The simplicity extends to the case back. Although this is typical of Rolex, I reckon the usual literature, e.g. model reference, water resistance etc be engraved on the case back. The slim profile of the case renders it easy to tuck under shirtsleeves as well. The engraved screw-down crown is easy to operate. The marking on the crown tells users that it's a twin lock as well. However, as with most Rolexes I've come across so far, the logo never seems to be positioned upright when screwed down completely. The case is finished with both brushed and polished surfaces. The bold 24-hour markers and brushed stainless steel bezel are handsome touches as well. the lug ends on this latest model do not just out like the previous model (ref. 16750) and not as sharp as well. The tapered, brushed stainless steel bracelet is another classic touch. All the links are solid. the gaps in between are tiny and closely meshed as well. 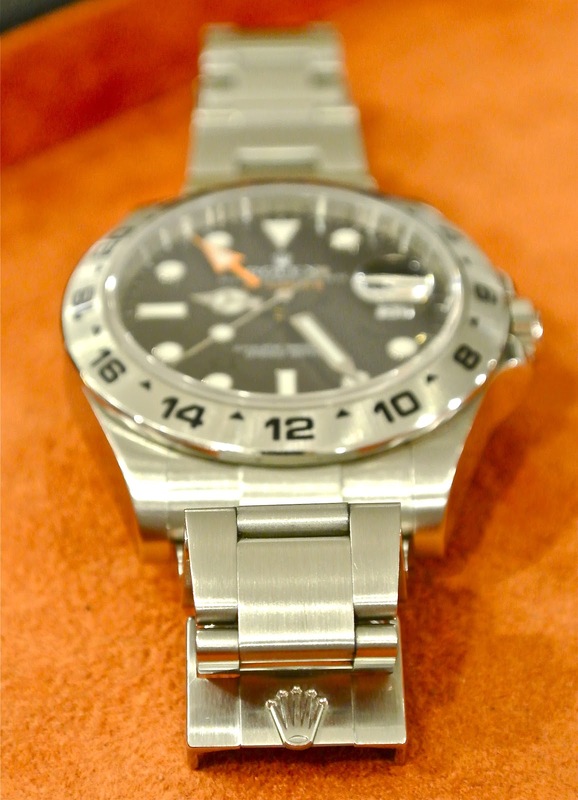 The latest Explorer 2 is also fitted with a new clasp that is chunkier and sturdier. However, the main clasp feels a little loose and far too easy to remove. It unclips with almost zero effort. However, the main attraction of this new clasp is the micro-adjustor. It allows micro adjustments to be made effortlessly. All you need to do is clip and unclip. I never realise how useful this is until I started using the watch. It's usefulness is obvious when you are exposed to temperature fluctuations, e.g. moving out of an air-conditioned environment into an unsheltered area bathed in bright high noon heat. This pieces has one of the most beautiful lume as well. It glows with a beautiful turquoise hue. This watch fits perfectly on my 6 3/4" wrist. There's no overhanging lugs and it doesn't feel awkward either. It looks and feel better than the previous 40mm model. This "grown up" Explorer 2 really is a beautiful watch from almost every perspective. It's versatile enough to be worn on the weekends or tucked under shirt sleeves on work days. It simply exudes classic elegance, but not in a dressy way. Movement : Rolex in-house Calibre 3187. - Excellent fit and finish. - Main clasp doesn't inspire confidence. - Logo on crown does not align upright. Great stuff! I got the White Dial Instead...Also Perfect!